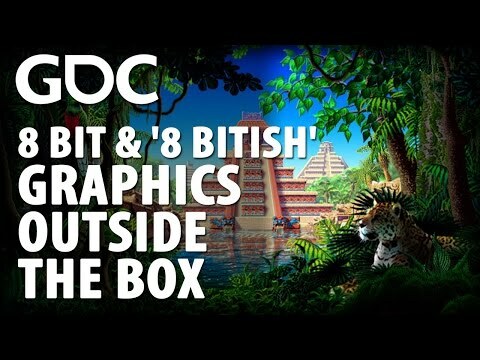 Lucasarts graphics veteran Mark Ferrari (Zak McKracken, Loom, The Secret of Monkey Island etc) demonstrates pixel drawing and animation techniques, particularly the use of colour cycling and pallet shifting. This is awesome! Thanks for sharing @retroFuture! @retroFuture: Have you got some recent work to show? I don't think I've seen your work in a while, and the stuff you did on zX was already good-looking. In particular, I've generally struggled with colour myself, and have been finding some inspiration in "old school" techniques where limited colour palettes are chosen from the start (because of limited colour channels, or limited paint pigments). I'd often just harmonised my colours afterwards by applying some sort of global colour balancing afterwards, which works, but kills some of the colour contrast that I otherwise see in some master painters' work. @Elyaradine: Sadly no new work (all my current sprite work is for zX / Phase Edge and personal art is acrylic painting). Although you have given me ants in my pants to create some of my own artwork. I promise to set aside some time for my own art. I was quite pleased to discover a tutorial on how to create dithering pattern brushes for Photoshop. So much easier than doing manual dithering pixel-by-pixel. Thanks for sharing this - this is important for us to learn and have knowledge of - not that we have to force it however it can help us.